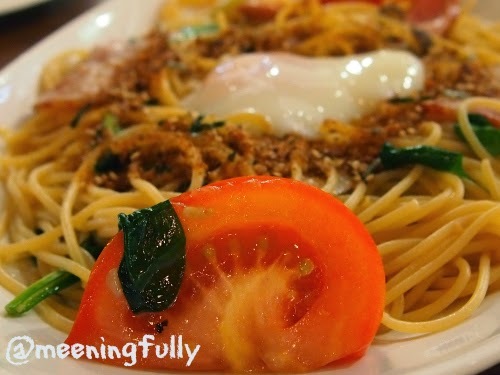 If you are a pasta and/or dessert fan, you cannot miss out on giving Miam Miam a try. "Miam Miam" means"Yum Yum" in French, and my tummy certainly had a yummy time when I was there. The infusion of Japanese flavours into French cuisine (or is it the other way round) promises a gastronomic experience for their customers. And if you love your food cooked on the spot upon ordering, you can be sure Miam Miam will not disappoint as they pride themselves for cooking every dish from scratch, although I must say this may be an issue during peak periods as it may prolong the waiting time for food to be served. However, what's a little bit of waiting for good food? The man and I visited the Miam Miam outlet at Bugis Junction 2 weeks ago. Perfect day to be dining out since we were on leave and the boy was in school. It has been some time since we were able to "paktor" (means to be on a date); have a meal without rushing through it and simply just hanging out like we used to. Bugis Junction has changed quite a bit since I last visited, which probably was more than a year or two ago. Miam Miam sits on level 2, right where the glass lifts open to, where BHG used to be. You won't miss it as it is pretty much open concept with some rather retro yet pretty looking furnishing. Nice retro-looking chairs. Would love such whimsical furniture in my own home. We started with some drinks. The man being the coffee lover, and me, a tea lover, it is not hard to guess what we each ordered. Miam Miam's hand dripped coffee is full bodied with an earthy flavor, and having it with ice made it a nice beverage to go with the warm desserts such as the french toast served. 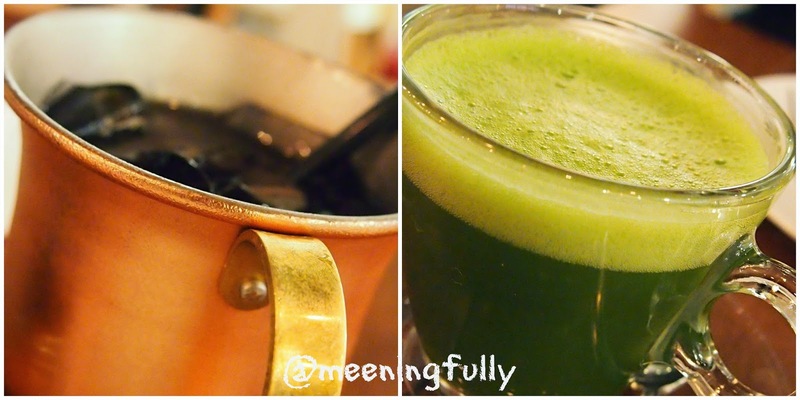 I picked their hot matcha which is made with the highest quality matcha which explains the intensed flavor. I thought it was nice to help wash down the food we have tasted. 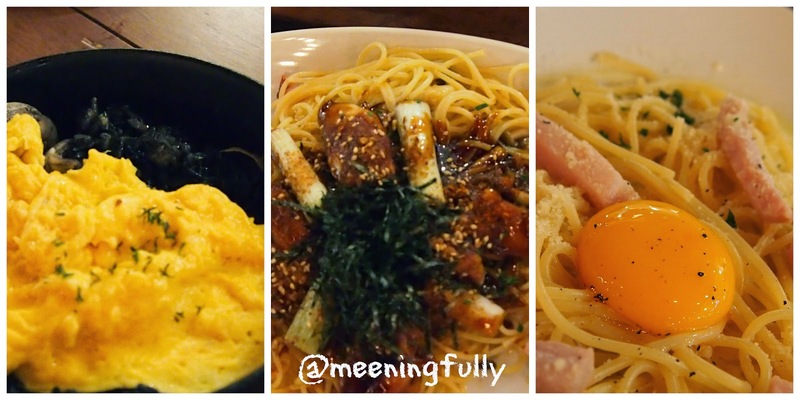 Moving on to the food, we managed to try quite a bit of what was on Miam Miam's menu that included the Miam Miam Spaghetti, Souffle de Nuage, Riz Au Curry, Riz Noir Squid Ink Rice, Chicken Teriyaki Spaghetti and Carbonara. So much to eat yet hard to resist especially when I am a huge carbo(hydrates) fan. This has got to be my favorite. It has a unique mix of shoyu and an apparent secret broth, with bacon, frankfurters, tomatoes topped with egg. It is hearty yet light at the same time. So, you don't actually get sick of it. 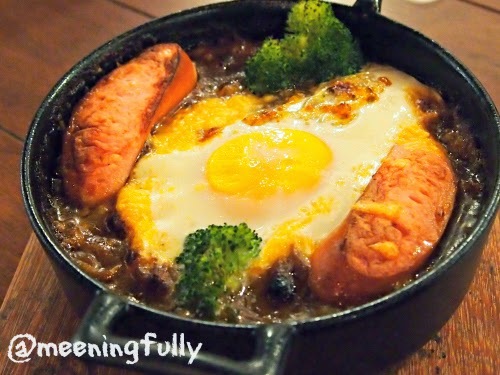 This is really baked Japanese curry rice with egg and frankfurter. I have always loved Japanese curry, so this to me is comforting. I would loved it with a little less cheese though. Something different of rice sautéed with tomato sauce under a fluffy cloud of eggs and cheese. 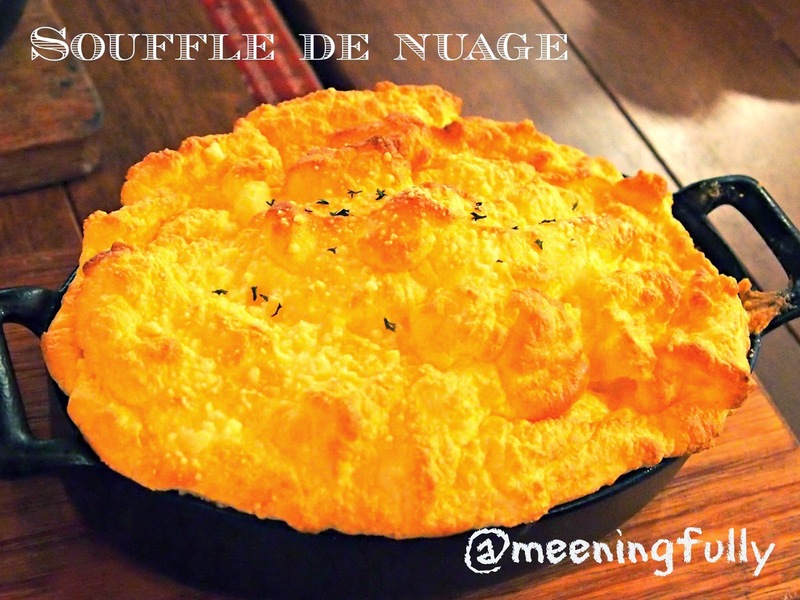 The Souffle was surprisingly light, and adds another texture to the dish. The tomato sauce is also not overpowering unlike most tomato based pasta is. So, I give this a thumbs up although I don't always fancy anything tomato. Left to right: Riz Noir - $16.50, Chicken Teriyaki Spaghetti - $15.80 and Cabonara - $15.80. These were some of the other mains that were served up. The man seemed to enjoy the Riz Noir, which is really Squid Ink Rice with mixed seafood and Omu. He felt that the rice was bursting with flavor, and unique nonetheless. I did not fancy it though. But if you like squid ink pasta, then you should give this a try. That was a lot of mains! And, by the time we were done with these, there was hardly any space left for desserts. 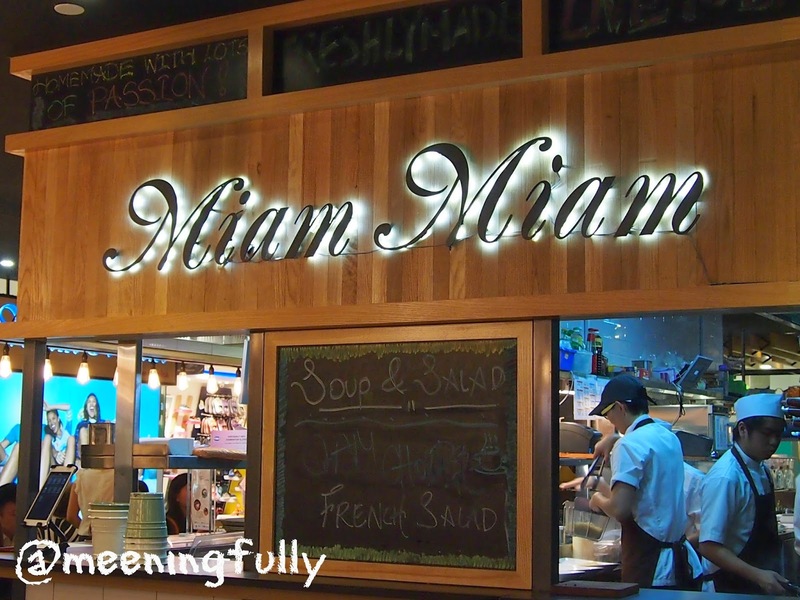 But, a meal at Miam Miam will not be complete if you do not try their desserts. So we just had to keep squeezing! OK! This is really a must have! 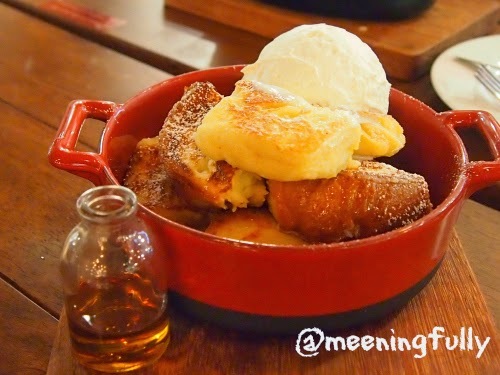 If you don't order anything else here... this french toast will have to be the ONLY thing you order. Thick toast, coated nicely with egg sprinkled with sugar. Not too soggy or oily. Love it. The pancakes are thick and fluffy, and supposed to be known as soufflé pancakes. I did not really enjoy this one firstly because the pancakes are too thick, and I felt the jelly did not really complement this dessert. 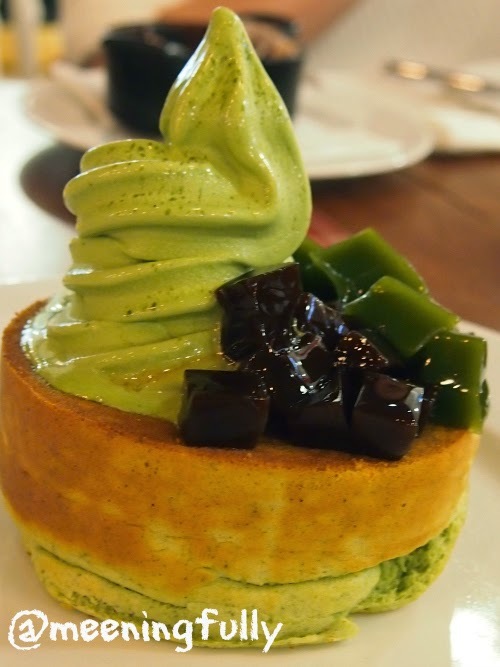 But, if you are a true blue japanese dessert fan, then this should be worth trying. The pancakes are the same thick ones, but I felt the combination of the pancakes with the bananas and vanilla soft serve help bring out the texture of the pancakes better. 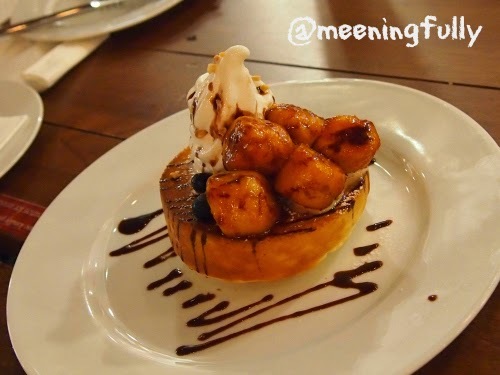 The caramelized bananas were a little too sweet though. Nonetheless, this helped end the meal nicely. Miam Miam is definitely worth visiting and I am sure they have something for every one. I will be back soon to try some other things on their menu such as their sandwiches and Mac & Cheese. I think the one thing I walk away from this tasting experience is that while traditional italian pasta are always full flavoured, Miam Miam brings pasta that's light yet with flavour. Miam Miam is also at Westgate Mall for all westies like us, so there's no excuse for you not to visit Miam Miam, even if it is just for tea. Being on level one, with alfresco seating at the courtyard, I would say Miam Miam's location at Westgate is perfect for families with little kids like mine. Space to run around while the adults enjoy their meal. 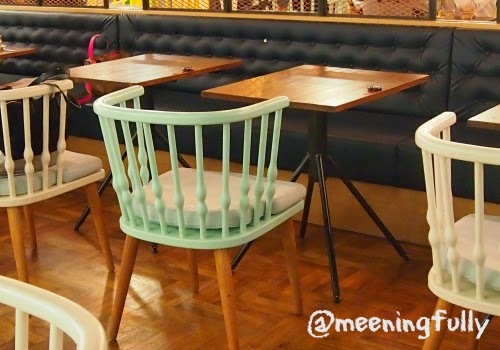 Disclaimer: Meeningfully was invited to Miam Miam Bugis Junction for a food tasting session. All opinions are my own. If you like what you read here, follow me facebook to get updated on all my latest posts.